Nutrition, as one of the basic human needs, is a highly important issue through all cultures and areas of life. In the medieval mind-set all aspects of nourishment are of a particularly high value not only as a physical compelling need, but also in dietetics and hygienic as well as in symbolism and religion. The roots of historic health care in Europe lie in the holistic perspective passed down in Antiquity with Middle Eastern influences. It’s all about the interaction of multiple influencing factors, which constantly affect a human being as a microcosm and as part of the macrocosm. The symbolic significance originates on the one hand from the dominating Christian religion and on the other hand from the characteristic medieval social order and the socio-economic environment. 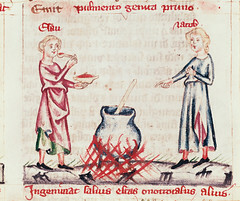 Medieval cuisine and hygienic are not only seasonally and regionally determined, but also effected by a constant cultural exchange through trade and crusades. Cooking recipes from this period therefore are more than simple instructions to prepare food, they provide us with a large quantity of historical-cultural information. Within this project pupils and scientists explore selected examples of medieval recipes, their spreading and lines of tradition. The research contains a practical approach, which helps to examine the findings by current standards and to determine the value of ancient knowledge for today’s life (e.g. relating to preserving different kinds of food, to natural food dyeing methods or to fasting for religious reasons or medical purposes). The students of the HLW Schrödingerstraße participate with their knowledge of cooking techniques and nutrition. In cooperation with two other schools (NMS Ferdinandeum and VS Pirka) the team will try to gather more information about the medieval knowledge in conjunction with eating habits and cultural dialogues in past and present. The findings are published in different ways for various target groups: There will be a scientific conference with an anthology, a cookery book, an internet cooking show, a weblog for children and teaching materials, which enable teachers to create their own teaching units and projects about nutrition and health care through the ages in different cultures. Facebook, Instagram and a bilingual Wordpress Blog help to reach a wider public and to offer them the possibility to take part in the project. The contrastive comparison of medieval eating habits and hygienic with the current state of knowledge is suitable for defining and reflecting our own position in present day. The anticipated results will shed light not only on historical research, but also illuminate today’s cultural differences as well as similarities and can therefore be useful for integration policies.